Hans Lucas von Cranach, Cast Bronze, 99.8mm (Oversized), 350g. Portrait Commemorative done in Renaissance style and commemorating his 30 years as the senior castle captain of the Wartburg in 1924. 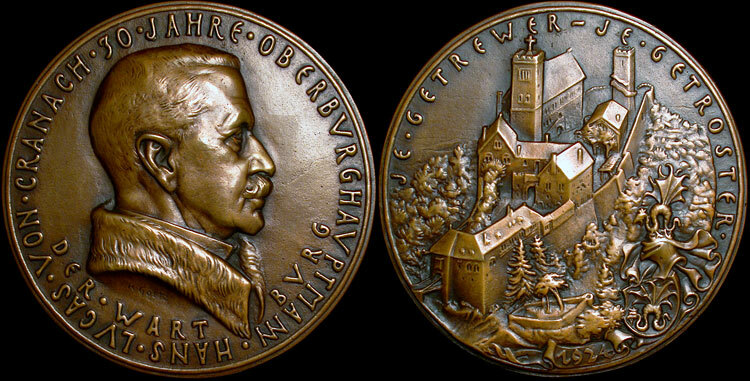 Obverse: Legend: "HANS • LVCAS • VON•CRANACH • 30 • JAHRE • OBERBVRGHAVPTMANN • DER • WARTBVRG" (Hans Lucas von Cranach, 30 years senior castle captain of the Wartburg). Reverse: Legend: "JE • GETREWER-JE GETROSTER" (The more faithful, the more secure). In exergue: 1924.